Goodbye Hotmail! Microsoft completes Hotmail to Outlook migration. For some time now Microsoft was maintaining two email services at the very same time. First the established Hotmail email service and then the recently released Outlook.com email service. Hotmail users could initiate a migration to the new email service using their account, but that was a mandatory thing up until now. Microsoft today announced that the company has finished migrating all Hotmail accounts and data from the email service over to Outlook.com. The numbers are impressive, as Microsoft migrated more than 150 petabytes of email in six weeks (a Petabyte or PB is 1000 Terabytes which itself is 1000 Gigabytes). Back when Outlook was introduced as a preview in February 2013, it had about 60 million active user accounts. With Hotmail users finally being all moved over, Outlook.com is now home to more than 400 million active users according to Microsoft, making it one of the most popular email services on today's Internet. Today's news marks the introduction of two new features to Outlook that some users may find useful. First, you can now do away with the "on behalf of" messages when you sent email using a different email address. Email that you sent from another account goes through the account's SMTP server now so that the recipient sees the correct email address and no longer the on behalf of information attached to it. Click on the gear icon in the top bar and select more mail settings from the context menu. On the options page, select your email accounts under Managing your account. Here you need to scroll down to add an email account and add the account that you want to use this way either as a send-only account or a send and receive account. Microsoft notes that it will add the SMTP information automatically during the process. The second feature improves the integration of the cloud hosting service SkyDrive in Outlook. 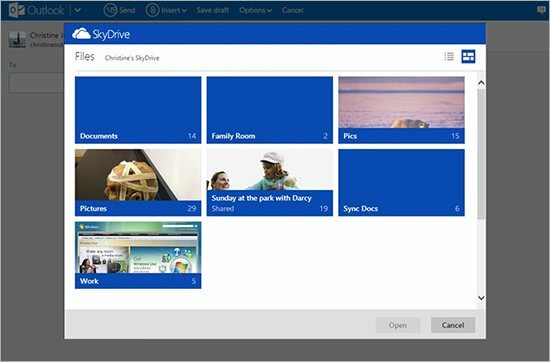 You can now insert files and pictures directly from SkyDrive into your Outlook.com emails. Just select insert from the menu at the top and select the share from SkyDrive option. Roll-out of the feature starts today and will be completed for all Outlook.com users in the coming weeks. There you have it. When you try to open Hotmail in your browser of choice you are now automatically redirected to the Outlook.com website. The post Goodbye Hotmail! Microsoft completes Hotmail to Outlook migration. appeared first on gHacks Technology News | Latest Tech News, Software And Tutorials.